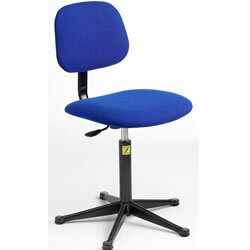 The static dissipative chairs are specifically designed for use in the electronics and electrical industry. Upholstered in hardwearing fabric. Available in Charcoal and Blue fabric or Black vinyl. Hard wearing black stove enamelled metal work. Fully adjustable back rest with gas lift adjustment.